A fully automatic shoe polisher is the ideal choice for your own home, making the dream of fast and easy shoe polishing come true. High quality materials guarantee an extraordinary shine and maximise the efficiency of a shoe polisher. Shoe polish machine boasts style, functionality and compactness. Thanks to the electric shoe polish machine there is no excuse for dirty footwear anymore. Supplies for your shoe-polishing machine. The special leather polish is available in one-litre bottles. For a long time, the shoe polisher was a luxury reserved for hotels and offices. Now, there is an ideal polisher for every household, although not all are created equal. We recommend the excellent shoe polishers from German manufacturer Heute. High- quality, safe and with a long warranty, they are tailored to the needs of shoe lovers everywhere. Our shoe polishers make the dream of clean and polished shoes in only a few seconds reality. The soft brushes will lend your shoes an extraordinary shine. Shoe polishers come in all manners of designs and at every price point possible. Nevertheless, you should be careful which shoe polisher you choose. Unfortunately, some cheaper models have been shown to over heat, whilst the brushes can abrade your cherished shoes. Some have sharp metal edges, which can damage your upper and for many, it is impossible to buy replacement brushes. For those reasons, Germany’s Heute have become one of the most trusted makers of shoe polishers. 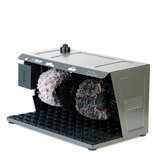 For over 100 years, they have offered perfect design and great service: a weight of 10 to 18 kg, three brushes (1,200 rotations per minute), a polish dispenser, a sturdy cover without dangerous edges and enough space for the shoes. Furthermore, the factory offers an extraordinarily long warranty lasting three years and the ability to purchase spare parts for a further 20 years. These warranties guarantee the durability of your Shoe Polisher. Using our shoe polishers is very easy. 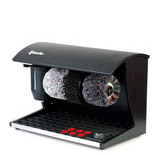 Motion sensors detect your foot or hand movement and activate the machine’s brushes. After a pre-cleaning with the dirt brush, put the shoe, complete with a small amount of polish, under the polish brush. Crafted from finest woollen yarn, the polish-applicator brush will spread the care product evenly over the vamp, whilst buffing the leather to an exceptional shine. A combination of hand cleaning and shoe polisher is the ideal choice. Please note: The shoe polisher is not for applying wax to shoe leather. 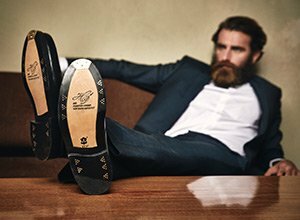 After removing dirt and grime from your shoes, rub a little amount of shoe wax on the upper manually. 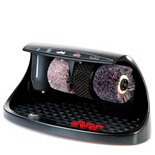 Wait a few minutes – after drying the shoe polisher is then perfect for an optimal polishing. Combining both techniques will give you the perfect shine in a matter of minutes.